Our friends at Auto Info Thailand says that the all-new 2019 Honda Accord is making its ASEAN debut at the upcoming Thailand Motor Expo 2018. 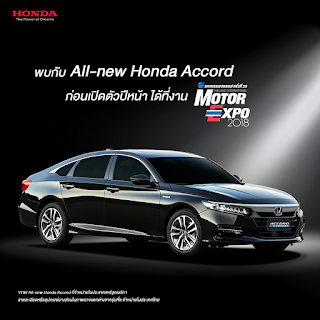 According to the site, a teaser photo (see below) released by Honda Thailand reveals that the Land of Smiles is already confirmed to get the new Accord Hybrid. 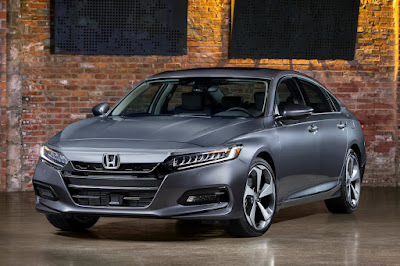 As such, Honda’s 10th generation executive sedan will deliver a combined 212 horsepower at 6,200 rpm and 315 Nm of torque from 0 to 2,000 rpm thanks to a combination of a 2.0-liter motor mated to Honda’s i-MMD hybrid system. A bit further away, in Korea, where the Accord was launched last May, the carmaker made it available with a 194-horsepower 1.5-liter turbo and a 256-horsepower 2.0-liter turbo as well. The latter is actually the very same engine powering Honda’s iconic Civic Type R although for its duty in the Accord, Honda saw it fit to mate the powerplant to a 10-speed automatic. And speaking of the Civic Type R, the all-new Accord shares its platform with it as well. For that, it has a low center of gravity and stretched wheelbase for sportier handling. It also uses laser welding technology for increased rigidity. Its heightened handling is also backed up by its bolder style with fastback-like styling. The question is: will Honda Cars Philippines bring in the new Accord? According to sources within the company, the automaker is still mulling on bringing this new executive sedan here given the segment’s declining sales over the recent years. However, because a close ASEAN neighbor has decided to bring it in (and there’s also the new Camry on the way), this may improve the chances of seeing it here locally. The Thailand Motor Expo 2018 runs from November 30 to December 10, 2018. It's quite surprising that the Accord, once a dominant force in the midsize sedan market along with the Camry, has been surpassed by the Mazda6 in sales. sobrang mahal na kasi ng mga honda..
Honda PH should try to market the Accord more often as well if they want sales. They never market the accord.....ever.. Yes, car companies never market the weak selling models. Its always the popular ones they always advertise which I think is extremely stupid. Sikat na nga, bakit pa kailangan iadvertise ng iadvertise? Kaysa magsayang sila ng pag advertise ng sikat na agad na model, mas maigi yung mga mas di kilala ang ipush nila. Mga b*b* kasi yang mga yan!